Activity Cube Five In One is five classic toys in one beautiful cube. 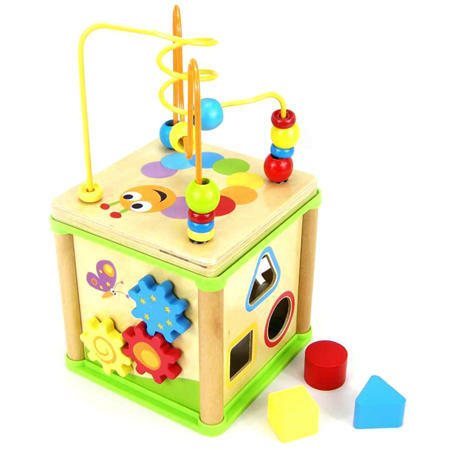 This wooden toy has a bead maze, clock, shape sorter, zig zag, and turning gears. The bead maze top of the cube can be taken off. When it comes time to pack up the maze turns upside down and fits into the cube its base becoming a lid. Very well thought out this brings together 5 educational toys for hours of fun. Material: Wood with child-safe paint. Strong plastic beads and plastic reinforced corners..
We like this because: "Great to get five classic toys in one."